Copyright © 2007 Jill E. Ryan All Rights Reserved. Do not take, copy, or use Art and/or Images without first e-mailing the artist, Jill E. Ryan for expressed, written permission. Art and/or art images cannot be used without artist's permission. Any unauthorized use is Prohibited by Copyright Laws. "Spark" Original Doll Art Sculpture. 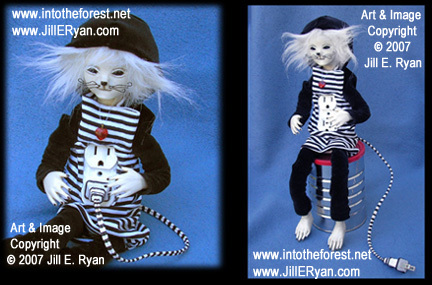 Designed, hand-sculpted ( no molds used ) and created, entirely by hand, by Artist Jill E. Ryan. Additional Details about this piece are listed and can be viewed below the first picture on this page. All Art, Designs, and Images Copyright © 2007 Jill E. Ryan All Rights Reserved. Do not take, copy, or use Art and/or Images without permission from the artist, Jill E. Ryan. 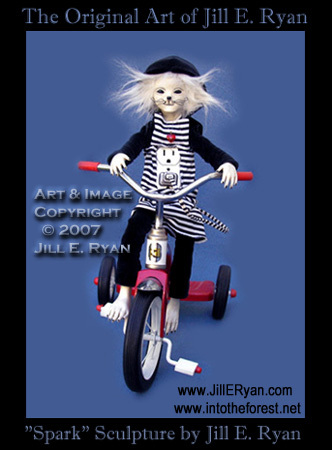 The Art and Images within this website are not to be used, copied, posted in blogs, and/or anywhere on the internet, etc., or used in any way, form, and/or media without permission from the artist, Jill E. Ryan. Any Unauthorized Use is Strictly Prohibited by Copyright Laws. To Return to Gallery One please click here.